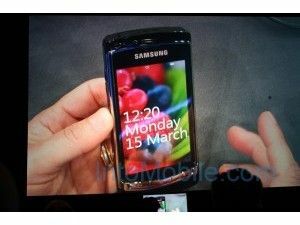 It turns out Samsung hasn't come out with its own version of a Windows Phone 7 Series device – it was Microsoft all along. We looked at the photos recently published of Samsung's supposed WP7S mobile, and couldn't help but notice the chassis looked blindingly similar to the Samsung i8910HD. So we did a little digging, and found that it's the very same device – just given a facelift by Microsoft. "The launch was from Microsoft, not Samsung, and they used the i8910HD to demo Windows 7," said a Samsung spokesperson. "It's not yet clear whether existing i8910HD users will be able to upgrade to Windows 7 as this demo was a one-off." So Microsoft must have an upgraded i8910HD on its hands, as we know the minimum spec to be a 1GHz processor with a WVGA screen – the Samsung model has none of these. It does, however, have the three buttons on the front. These were originally for calling, menu and hanging up – but Ballmer's Bunch has popped the Start, Search and Back keys on them instead. We'll put our necks out here and say this Symbian phone won't upgrade to Windows Phone 7 Series – but we'd love a device with 720p video recording, if you don't mind.